Developers of the downtown mixed-use retail and residential FiveSouth project will reduce its $35 million tax increment financing district by nearly a third. With a reduction in building costs, Don Cardon of Cardon Development Group and other partners plan to go before the Bismarck City Commission during the first quarter of 2017 to update commissioners with new cost projections. Cardon said they’re also truncating the timeline for building the project. Instead of taking eight years to develop the four corners of Bowen Avenue and Fifth Street, they expect to have a complete project in three years, with Jim Christianson signing on to develop the five-story mixed office and retail building on the intersection’s southeast corner. “We can do everything for less money,” Cardon said. The $35 million for the project’s public infrastructure will drop by 20 to 30 percent. There will be a decrease in the $120 million investment mark the developers have to meet, too. This is amid groundwater issues that will force contractors to dig down around an extra 100 feet. “But if we don’t deal with it, the property will never be developed,” said Cardon, who indicated he’s glad the development is going to be built in a down market. 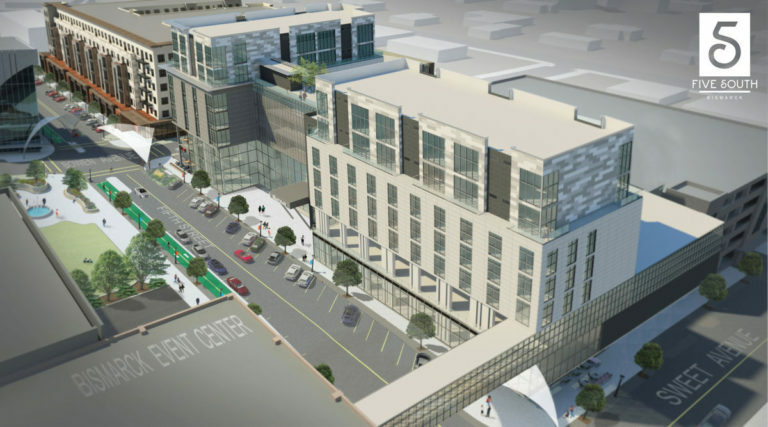 Cardon Development Group struggled to get a full-service hotel for the project. “It was hard to get a four-star hotel in Bismarck,” Cardon said, though there were lots of offers for limited service facilities. So Cardon and his wife bought franchise rights for a Sheraton Hotel. “I’m not a hotel developer,” he said. “We chose to invest our own money or it wasn’t going to happen,” he said, as many national investors associated Bismarck’s market with the oil economy of the Bakken. Cardon said some have questioned whether this project will get built or if it was just hype and he’s focused on making sure it’s not the latter. The hotel is slated for 150 rooms. The penthouse will feature eight 1,400- to 1,800-square-foot condos, priced from $425,000 to $460,000, Cardon said. The condos will have full concierge service, access to the hotel fitness center and laundry services. Cardon’s apartment complex has been scaled down to 196 units — 166 with market-based rent and 30 workforce-priced units meant for essential service workers, such as hospital employees. Minneapolis-based Crave American Kitchen & Sushi Bar, which Christianson called “a big win for Bismarck,” will be expanding its footprint within the hotel. The restaurant will be two stories, with a balcony overlooking the Bowen Avenue and Fifth Street intersection, as well as street-level patio dining. A coffee shop, which Cardon said will have “ambiance we haven’t seen in Bismarck,” will fill another corner of the hotel lobby. VanDeWalle Architects LLC out of Sioux Falls, S.D., and Kansas City-based JE Dunn Construction have been hired by Cardon Development for the project. Christianson has brought on Consolidated Construction for his 100-by-300- foot building. Christianson said he his looking for a bank as a first-floor tenant. The second, third and fourth floors will contain office space. The fifth floor will have seven two-bedroom, 1,200-square-foot condos, which will cater to a different market from those atop the Sheraton. The price point for the condos will be $250,000 to $300,000, which Christianson said is on par with Bismarck’s $284,000 average selling price for a single-family residence. Christianson said apartment and office space vacancies have increased but those spaces are located where FiveSouth is. “It’s a location driven deal,” he said. Christianson is looking for a lunch and dinner restaurant for the building’s northwest corner. With hopes for a microbrewery tenant on the ground floor of Cardon’s apartment building, three of the four corners of the Bowen Avenue and Fifth Street intersection would contain dining. The fourth would be green space — a combination meant to “activate” the intersection for community social events. “It becomes a district, a destination in a lot of ways,” Christianson said, making it good for events such as a summer outdoor jazz concert series on the street. Cardon said there has been a lot of interest from possible ground-floor retail tenants. Construction will start in spring or early summer and is anticipated to take 16 months, according to Cardon. “The good news is we still have a project in the face of what’s been going on the last 18 months, instead of empty park lots,” said Christianson, adding that the property tax collected in the area will go from $50,000 to north of $1 million. In anticipation of the project, tenants of the city-owned Bowen Avenue strip mall have been vacating their spaces. Sleep On Mattress moved to Gateway Mall in the space across from Prairie Creek, the owner of Big Apple Bagels and the adjacent clothing boutique has moved her store back to Williston and Quiznos has closed while it looks for a new space. Only Tobacco Row and Electrolux vacuum store remain amid uncertainty of when they’ll be asked to leave. City Administrator Keith Hunke said, as leases at the building have expired, the city has begun renewing them on a month-to-month basis only. He said the city will inform any remaining tenants as soon as the city knows a groundbreaking date is set.